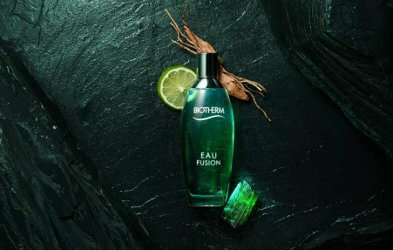 Biotherm has launched Eau Fusion, the latest in their series of perfumed body sprays. Eau Fusion Eau de Toilette is a body mist infused with Tourmaline dust. A fusion of water and crystals, inspired by lithotherapy, this revitalizing and rebalancing fragrance mist will help improve your personal well-being. Shake it and create clouds of the precious stone, a powerful ingredient with positive energy. Uplift your vital energy thanks to the perfect alchemy of fizzy citrus natural essences and a fresh mineral accord enriched with vibrant floral notes. Biotherm Eau Fusion is available in 50 and 100 ml Eau de Toilette. I thought it was a bottle of Perrier! Ughhhh alchemy is right; that’s a solid comparison for these bunk claims. Same! I feel like such a grinch rolling my eyes over the crystal stuff, but it just feels gimmicky. Oh no. I’m not going near crystals. I tried to believe in their supposed energies for a while before logic kicked in. But I still enjoy looking at my hefty amethyst crystal clustre and the rainbows in my rock crystal ball. With this release Biotherm is taking the idea of aromatherapeutic waters – popularized by Clarins Eau Dynamisante in 1987 – to new lofty levels of esoteric drivel.